Broadway sci-fi smash musical, performed in English by a multi-national cast of talented students from the British International School of Cracow. 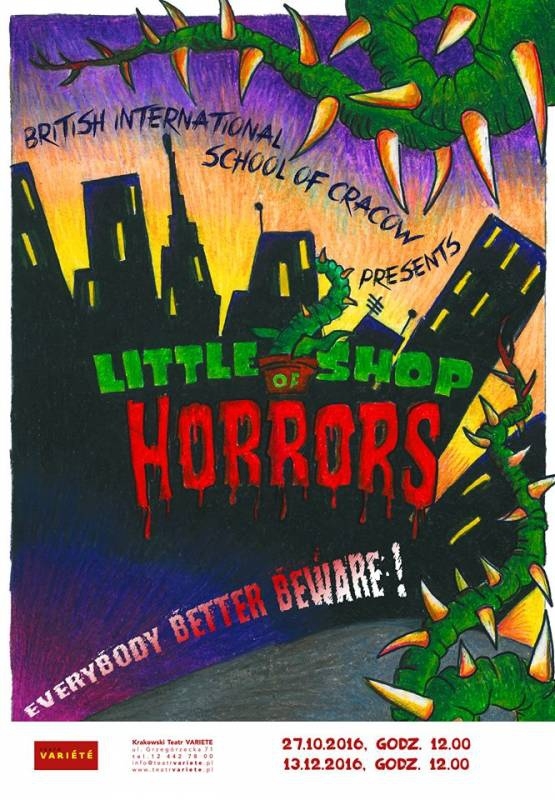 A deviously delicious Broadway and Hollywood sci-fi smash musical Little Shop of Horrors has devoured the hearts of theatre goers for over 30 years. Howard Ashman and Alan Menken (Disney’s Little Mermaid, Beauty and The Beast, and Aladdin) are the creative geniuses behind what has become one of the most popular shows in the world. Seymour is a nerdy floral clerk with a knack for plants, but not much else. However, one peculiar plant he’s tending might just be his ticket to fame, fortune – and the girl of his dreams. There’s only one teeny — but ‘growing’ — problem: This plant has an unquenchable thirst for the red stuff (type O, A, or B… the plant is not picky). Mixing Motown, B-movies, and The American Dream, Little Shop of Horrors is the screamingly funny, gleefully twisted, out-of-this-world hit musical. Performed in English by a multi-national cast of talented students from the British International School of Cracow.